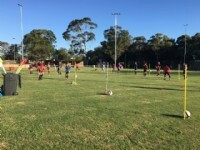 Due to forecast hot weather on Sunday 21 January, Please be advised that the 2nd U11/U12 mixed Trial session and the 1st U16 Girls Trial will be pushed back to a 6pm start time. Please arrive with enough time to register and ensure you have water bottle and are well hydrated, extra water, shade etc available. A revised session with plenty of drinks breaks will kick off when the temperature reduces into the evening.